Kids learn about nouns, verbs and adjectives early on, but it takes practice to be able to recognize these parts of speech in sentences. 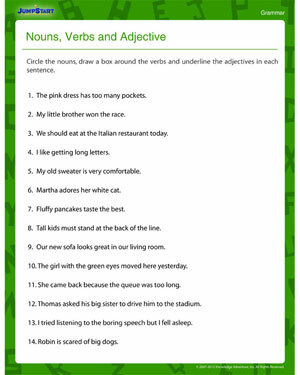 Ask your fourth grader to grab a pen and see how many nouns, verbs and adjectives she can recognize from the sentences in this worksheet. This printable printable grammar worksheet is perfect for identifying the problem areas in your child’s understanding of the parts of speech.